It has finally happened! A new ferry, Ferry Xpress, has succeeded in opening its operations between Panama and Colombia to ferry passengers and vehicles around the Darien Gap. We’ve read initial reports from overlanders who have successfully made the crossing. Click the link below for more details and to book. We gave up on the ferry and shipped in a container. I don’t believe the ship will sail before 2013, if ever, due to the refusal of the Colombian government to issue the permits to the ferry company. As of now, it’s my understanding that the ferry is still in Greece. Return ticket by plane (if you are not returning on the boat, you must already have the plane ticket in hand): this is for the locals no YOU. Power of respresentation on vehicle: if you are still making payments, you need permission of lender to leave the country. This is for Panamanians and Colombians. You already own the car or you wouldn’t have gotten that far. insurance available as well as registration at the port (Which Port? ): Answer is: the port you leave from. This is for the locals Colombian and Panamanian. I went into the office and spoke to the ferry company. The official word is that the ferry will sail on JULY 2nd! I don’t personally place much confidence in this estimate. The reason for the delay is that the ship has been unable to secure all required permits from the Panamanian and Colombian governments. We have abandoned the idea of the ferry and are in the process of getting Nacho on a container ship. Our friend booked a trip on the ferry before he knew about the delay, and is now having a hard time getting a refund. They refuse to reverse the charge on his Visa card, and instead say they are only able to issue the refund as a paper check. This is bad, as overlanders are generally unable to do anything with a check. Discussions with his bank and Visa have all ended in saying that the company needs to reverse the charge, but again, they refuse. Seems like a slightly shady company. I would recommend waiting until it has actually sailed before you make any plans to use it. I also asked him about the requirement to buy a plane ticket back to Colombia in order to use the ferry. This made no sense to me before I spoke to the company. After speaking to them, it still makes no sense. They said “If you do a round trip, you have to have a plane ticket back to Colombia. If you go one way from Panama to Colombia, you don’t need one.” I said “Nut I thought you had to buy a round trip ferry ticket.” He responded, “Yes, you do.” The conversation ensued, but I was unable to make any sense out of what I was told. If I were booking a ticket, I would forget about buying a plane ticket. It just seems too ridiculous to be true. I also got the feeling that the agent was making stuff up while he was talking to me. Just a hunch. I got some more clarification on pricing, and have updated the appropriate sections below, accordingly. Finally, the elusive “customs charge” is said to be included in the impuestos (taxes) of $95 or so. Is this true? Who knows? I didn’t feel warm and fuzzy after the discussion, as it seemed he was making stuff up. Again, just a hunch. The ferry has been further delayed. They haven’t given any specific details yet, but provided the following statement. We hope to know more tomorrow. If you’re driving from Central America to South America, I expect that you already know that you can’t drive the whole way. Standing between the continents, Panama and Colombia are separated by a swath of jungle called the Darien Gap. There are no roads, and it is inadvisable to try to cross on foot due to the danger imposed by the jungle and the near certainty of being captured by the FARC or other paramilitaries. 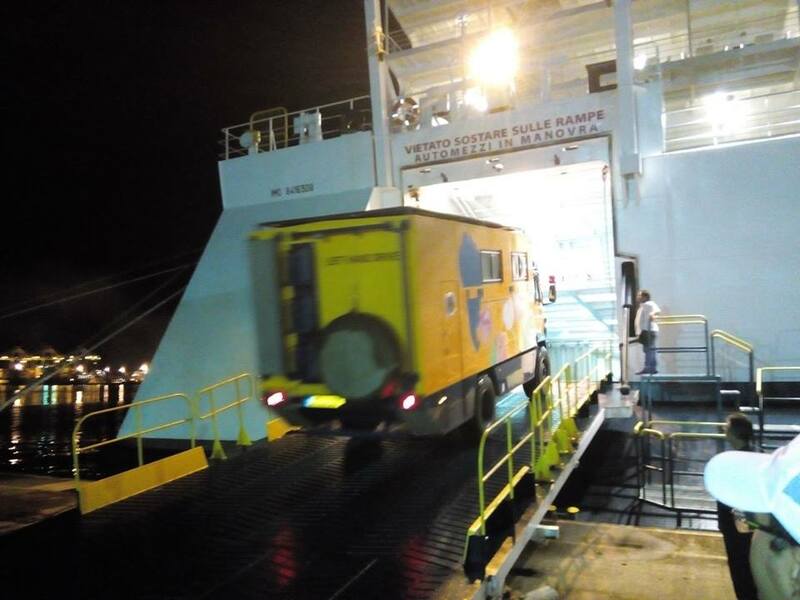 Until now, the only way to cross the gap with a vehicle has been to load the vehicle in a shipping container and send it by container ship. The driver and passengers were then responsible for getting themselves to Colombia by plane or boat. The process is daunting, very time consuming (weeks), and has unfathomable amounts of red tape. Now there is a new option. On May 31, 2012, a new ferry will be making its maiden voyage across the gap. The ferry will take passengers and vehicles, taking a huge headache out of the Pan-American drive. 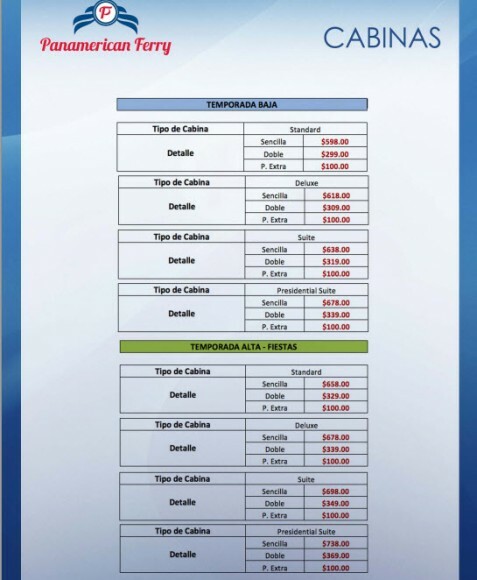 I have contacted the Panamerican Ferry company and obtained as much information as is available at this time, and have translated it from Spanish into the text below. I’ve taken liberties by placing it in sections, rather than leaving it in the jumbled format in which I received the original information. Note that the information provided to me in Spanish was shoddily written, and many parts left questions unanswered. It seems that many details are still being ironed out, so exact costs and timing are not yet available. I have marked ambiguous sections in RED, and will be attempting to get clarity on these in the coming days. Check back for updated info. NOTE: This information is provided as a guide only. You should do your own research if you plan to book a spot on the ferry. Any harm that results from your use of this write-up is your own damn fault, so leave Brad, Sheena, and Nacho out of it! The ferry leaves the port of Colon on Mondays, Thursdays and Saturdays. From the Port of Cartagena, the Ferry leaves on Tuesdays, Fridays and Sundays. Departure time from both Cities is 18:00 hrs. and arrival at the next port at 06:00 hrs. you should be to check in from 14:00 hrs. to 16:30 hrs. We have three types of occupations: chairs, shared bedrooms, and private cabins. Prices start at $99 + tax. 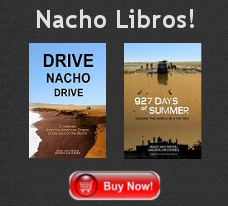 (tax is $95). The tax is the same for all types of accommodations. Tickets are round trip, as we do not sell one-way. See later section for exact pricing. Children under 2 years pay only taxes, while children over 2 pay the regular rate. Meals and drinks are not included in the price but can be added to the cost of your reservation for $40. This price covers both dinner and a buffet breakfast on the outbound and return legs of the trip. When boarding the ferry, adults must make a deposit of $50. This deposit is for any extra food, drink, and other expenses incurred once aboard the ship. This will be refunded in full if not used once the ship arrives in Cartagena. 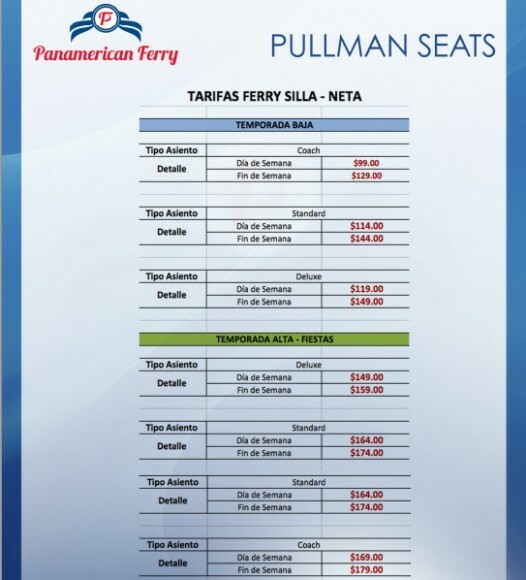 Phone reservations for the journey from Panama to Colombia can be made by calling (507) 380-0900. Reservations and prices are valid for 48 hours. Foreign residents: Valid passport and immigration status (resident card) under the rules of migration. Two bags per person. Max 50 pounds each. If you exceed the 50 pounds, or per bag will be charged $35 which must be paid in the port. 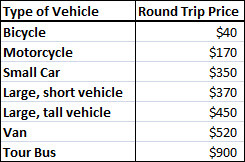 Rates depend on the type of vehicle to be shipped. Note that there will be additional fees for fumigation and customs, but these fees have not yet been determined, as negotiations are still ongoing between parties in Colombia and Panama (as of this writing, 5/12/2012). Self check in is at 9:00 AM and there will be authorized staff on hand to make revisions. You should take into account that there will be other people transporting their vehicles so we request your patience. The process will be cautious and thorough.On board you can obtain international insurance, and in the port of Cartagena you can obtain your registration certificate. You can expect the combined cost of these two documents to be approximately $200. Upon arrival at your departure port you must file a registration certificate (PANAMANIANS/COLOMBIANS ONLY!). This certificate will cost approximately $250. The documentation for the return trip is to be processed on the day of the return, and all paperwork can be done at the same time when you arrive at the port of Cartagena. International Insurance; this can be purchased on board the ferry and the registration certificate is available from the port (WHICH PORT?). The following pages were provided by the ferry company. Note that each page has a low-season table and a high-season table. TO ME THE CABIN PRICES SEEM UNCLEAR. WHY IS A SIMPLE ROOM MORE EXPENSIVE THAN A DOUBLE ROOM? I WILL INQUIRE WITH THE COMPANY AND REPORT BACK. Based on the experience of a fellow traveler who is at the port of Colon, paying for a reservation by credit card will incur a 3% charge. 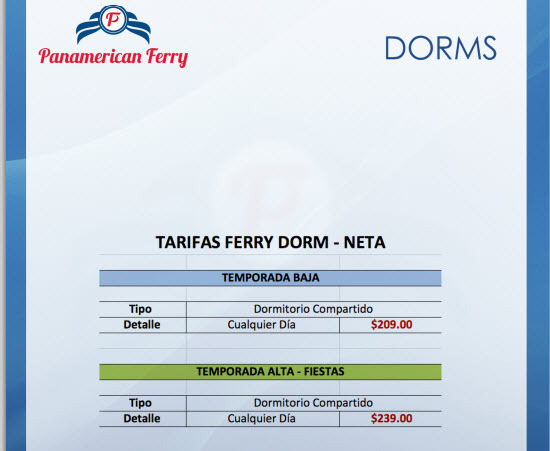 Thus, based on the information provided to me by Panamerican Ferry, this is what I would expect our trip to cost after all is said and done. Bear in mind that it is still unclear whether we’ll have to pay to obtain a bill of lading or other mysterious paperwork referenced in the above article. We also don’t know the cost of fumigation and customs. This is cheaper and faster than splitting a shipping container with someone else and then flying or boating to Colombia. It does seem like a headache up front, but shipping on the container was so, so terrible. If the ferry ever starts up, it’ll be a life saver.